Did a statin increase my chance of a heart attack? I’m going to tell you a horror story. It’s a bit long, and has plenty of twists and turns, but I assure you it ends with a happy resolution. I’m not a doctor, or a biochemist, I am just a computer programmer (with a few undergrad biochem credits) who got sick, and doctors couldn’t really help me get better … so I determined to debug my deranged metabolism in much the same way I would a misbehaving computer program. These days I do a podcast with another computer programmer ( 2ketodudes podcast ) where we talk about Diabetes and ketogenic diets. But in 2004 I was first diagnosed as pre-diabetic. I had started an Atkins style low carb, high protein moderate fat diet to stave off type 2 Diabetes. My LDL cholesterol was a high normal 170 mg/dl. 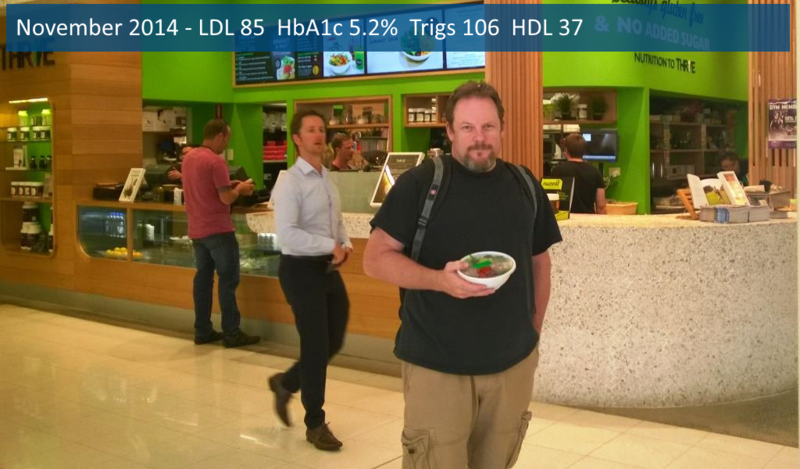 BTW: I’m going to use US style units as most of my audience is American but for Aussies who can do the math – Cholesterol mg/dl -> mmol/l just divide by 38 – Triglycerides mg/dl -> mmol/l divide by 88. My LDL “Cholesterol” had slowly increased to 208 mg/dl (5.4mmol/l). That wasn’t necessarily related to the diet (which at that point was more like lazy atkins) but probably a genetic propensity for higher than average “cholesterol” and age. I’m going to show you a sequence of 7 blood tests over 4 years to show how I fixed and then broke and then fixed myself again. For this story I’ll focus on the amount of LDL-C in mg/dl (that’s cholesterol in Low Density Lipoproteins which you might know as “Bad Cholesterol”), %HbA1c which is a rough average measurement of my blood glucose, my Triglycerides in mg/dl (that’s the fat made by my liver from carbohydrates), and my HDL in mg/dl (the “good” cholesterol). So In 2011 I was pretty healthy, a little overweight but riding 30-50km a week, working out at a gym 4 days a week. Analysis: The measure of sugar in my blood (HbA1c) is a pre-diabetic level. 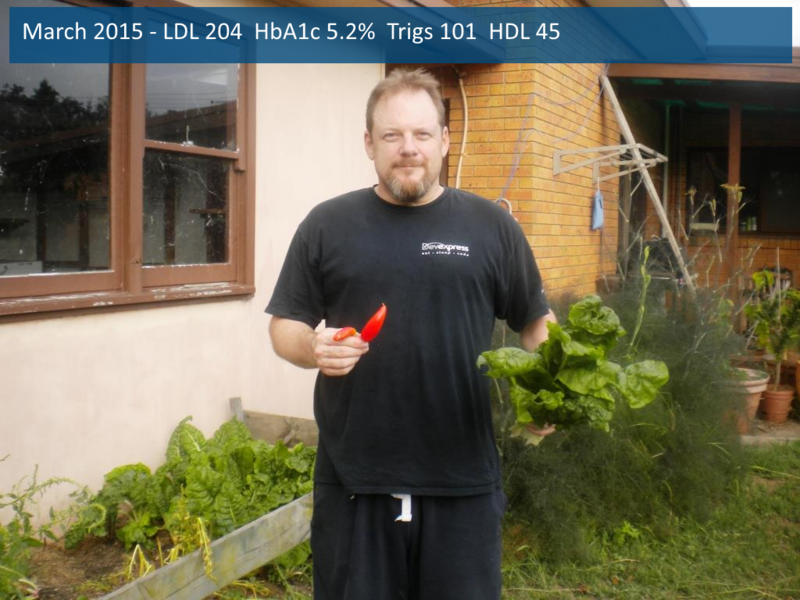 I was headed for diabetes but I was managing to keep it at bay with a mostly low carb diet. You could see that from the fact that my triglycerides were pretty low – this also indicates that my LDL was mostly benign pattern A rather than atherogenic pattern B. 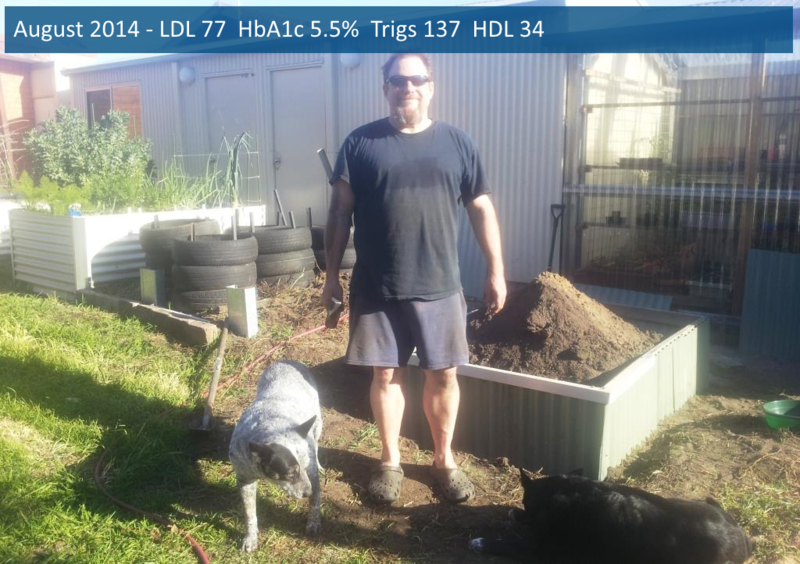 My HDL at 45 was quite high for me – another sign of a low carb diet. … So on Doctors orders I started taking a drug called a statin, stopped my low carb diet and began following the Heart healthy (low fat) diet. By the next year I had started to obviously put on a lot of visceral fat. I didn’t know it at the time but I was becoming diabetic. 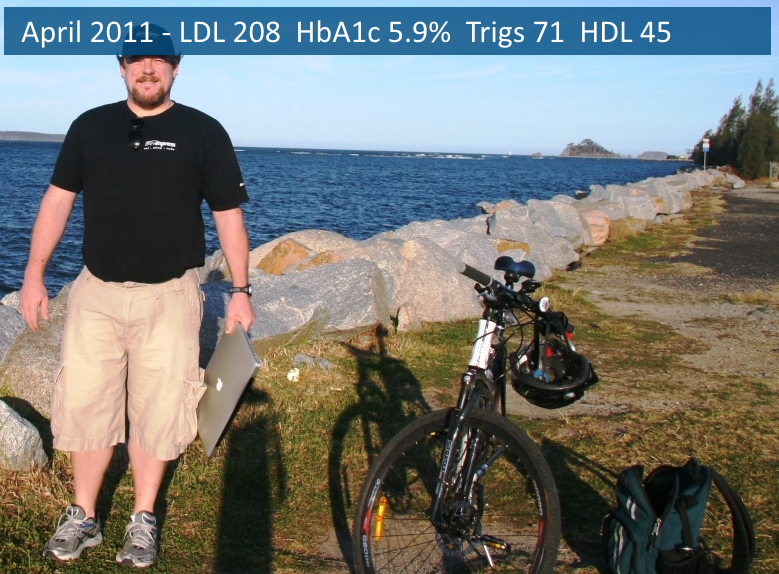 Analysis: My HbA1c was now at the top end of the pre-diabetic range (5.7%-6.5%). My My LDL was down below the reference range for statin therapy, so the intervention had … for lack of a better term, worked. Unfortunately my good cholesterol also dropped a little and my Triglycerides had almost doubled (I was eating carbs as ordered) but that wasn’t on anyone’s radar. Now you can really see that visceral fat being deposited around my liver. I was still riding everywhere and going to a personal trainer doing 2 days of cardio and 2 of weights every week. Analysis: OK now my HbA1c indicated that I had actually crossed over into a diabetic range. My LDL was up a little but all the more reason to stay on statins, right? 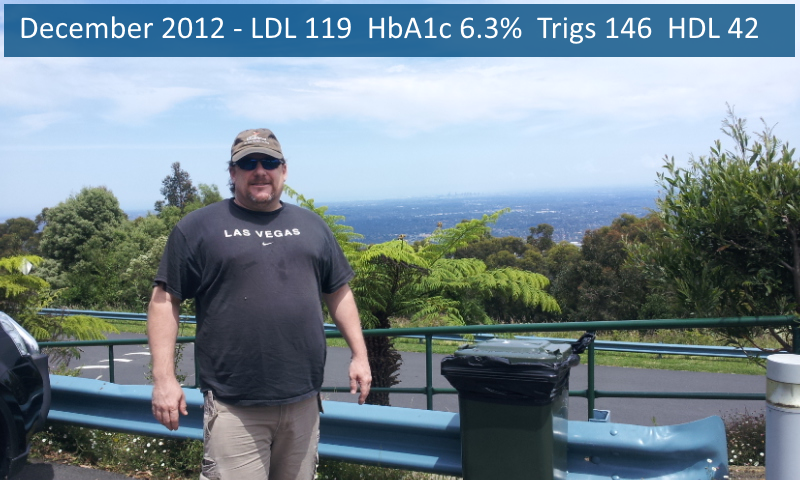 My Triglycerides stayed high but now my HDL was dropping quickly. Again not on anyone’s radar. Now I am sick. I know it. My doctor knows it. My friends and family all know it. – it’s Type 2 Diabetes and it comes from eating too much and not exercising enough – although I was still cycling 30k a week and training 4 days a week, clearly not exercising enough. At one point I had an infected toe become so bad that I almost lost the toe. Analysis: My HbA1c is well into Diabetic ranges. But the good news is that statin therapy has worked to lower my LDL – quick victory lap over how healthy my cholesterol level is. Sure my “bad” LDL cholesterol was down, but so was my HDL, and my triglycerides had almost quadrupled. Still these were on no radars. I did learn about now that there are actually multiple types of LDL particle, some are pattern B so called atherogenic and some are pattern A and are mostly benign. So not all “Bad” cholesterol is bad, some is benign. (Science: Atherogenic Lipoprotein Phenotype ). 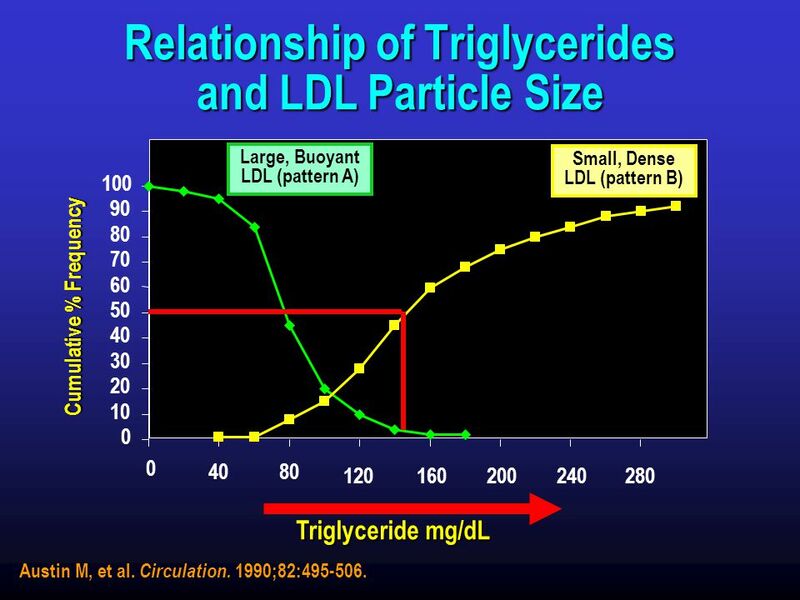 It also turns out that whether you have Bad LDL or Benign LDL is driven by Triglycerides. At 233 mg/dl I have only small dense (pattern B) LDL, so even tho I have less LDL Cholesterol, my LDL lipoproteins are all bad. 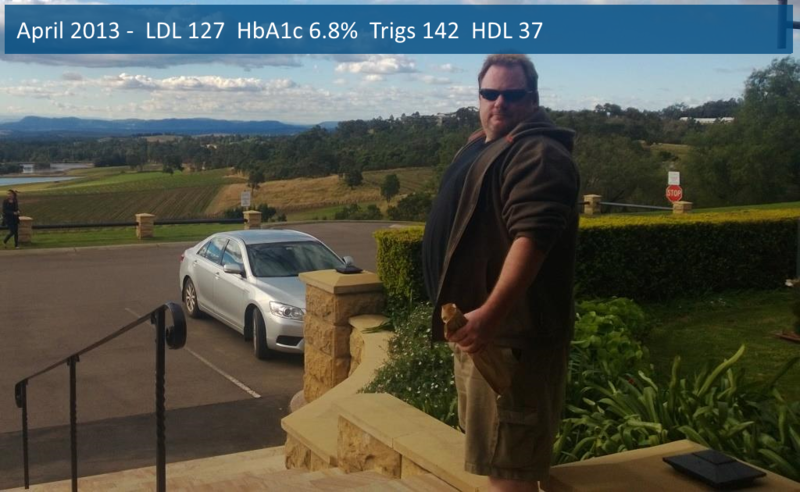 Contrast that with where I started – I had 208 mg/dl of LDL (High LDL) and 71 mg/dl of Triglycerides. My LDL was large buoyant LDL (pattern A) – the benign kind. Just to rub salt into the wounds It turns out that low carb high fat diets such as the one I was on when I started specifically increase the benign kind of LDL (as well as lowering Triglycerides and raising HDL) and the low fat diets (such as the one I went on when I started statins) increases the bad kind of LDL (Science: Low-density-lipoprotein subclasses and response to a low-fat diet in healthy men). Keto is strict nutritional ketosis – so trace carbohydrates, minimal protein and fuel on fat. But for a diabetic it means stable glucose control. Analysis: My glucose control has now dropped past pre-diabetic, to strictly non diabetic levels. I’m still on a Statin so my LDL is still being “controlled” but now the low carb diet has started to affect my Triglycerides and HDL. According to my triglycerides, My LDL is still mostly the kind associated with Heart Disease but it’s trending in the right direction. In October of 2013 the ABC’s Catalyst program aired a series of shows called “The Heart of the matter” which called into question the benefit of Statins ( you can still watch it online ). I asked my Doctor if I should go off the statin but he was not sure that my turn around in my Diabetes was permanent so he suggested I have another blood test in 3 months and stay on the statin therapy. After a second test my glucose was under even better control, so my primary care physician gave me the OK to discontinue Statins. Analysis: My Glucose control is pretty good now even for a non-diabetic. My LDL is still affected by statin therapy … but from now I’m off them so I think the less said about that the better. My Trigs are dropping and my HDL still going up thanks to a low carbohydrate diet. Finally I get another test and look … 4 months off statins and my LDL has gone back up to it’s normal level. I have since learned that there is a side effect of statins that even most Doctors don’t know about – it makes people more insulin resistant, which can cause pre-diabetic people to develop full strength Diabetes. Before I took a statin I was pre-diabetic, and not yet diabetic. Type 2 Diabetics have a significantly greater risk of Cardiovascular disease. Before taking a statin my LDL was, according to my triglycerides, pattern A and mostly benign. So in the time that I took a statin, becoming diabetic AND changing my LDL into atherogenic pattern B subclass – increased my risk of Cardiovascular disease. 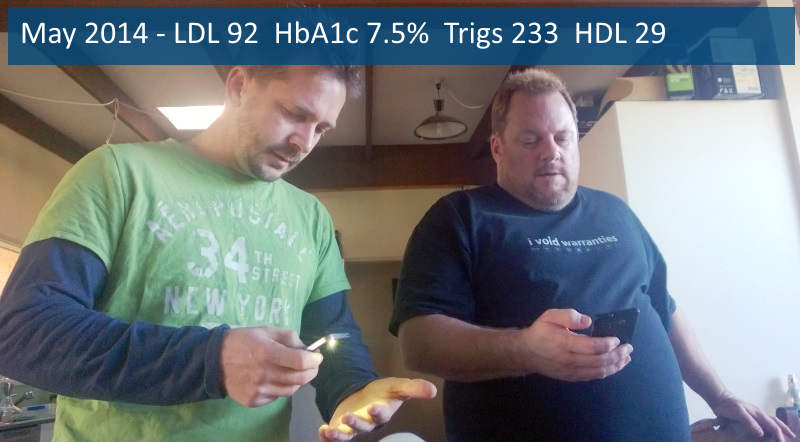 I can’t tell you that taking a statin gave me diabetes … but I’m glad I no longer take one. Excellent post. I was put on a statin drug after having an abnormal EKG and being diagnosed with heart disease. At the same time, I immediately went on an Atkins style diet and started measuring my fasting glucose level every morning. I noticed that over time my morning fasting glucose rose from a normal level of 80-90 to pre-diabetic levels of 100-110 even though I was eating low carb. This alarmed me to say the least. After reading more about the dangers of statins, I decided that they do more harm than good. I’ve since transitioned to a ketogenic diet and stopped taking statins. My fasting glucose level has now returned to normal of 80-90. Total cholesterol is 220 but I think this not that abnormal for someone 60 yrs old. So I would urge everyone to think for themselves when it comes to their health. P.S. I recently discovered the 2ketodudes podcast and I love it.